White Rock Minerals (ASX:WRM) reports that Sandfire Resources (ASX:SFR) intends to take up its option to enter an earn-in joint venture agreement in relation to WRM's globally significant high-grade zinc and precious metals VMS Red Mountain Project in central Alaska. White Rock commenced a strategic relationship with Sandfire in July 2018 in relation to its Red Mountain Project and SFR's decision to exercise its option is an endorsement of the quality and potential of WRM’s VMS project that could unlock value for shareholders. The JV will enable WRM to benefit from Sandfire’s significant technical expertise to develop the Red Mountain Project as well as further strategic support as the company moves to unlock the potential from its large strategic land holding. In addition to the $2.5 million equity contribution under the Subscription Agreement, Sandfire has also previously provided an unsecured $1 million convertible loan to WRM. The Red Mountain Project is located in central Alaska, in the Bonnifield Mining District, and comprises 754 mining claims over a total area of 475km2. The project contains polymetallic VMS mineralisation rich in zinc, silver and lead, with potential for significant gold and copper. Mineralisation occurs from surface and is open along strike and down-dip. Historical drilling was used to determine a maiden JORC 2012 Mineral Resource estimate for the Dry Creek and West Tundra Flats deposits. The Inferred Mineral Resource contains an impressive base metal and precious metal content with 678,000t zinc, 286,000t lead, 53.5 million ounces silver and 352,000 ounces gold. The $1 billion-capped Sandfire Resources is a leading mid-tier Australian mining company focused on discovering, developing and operating high quality resource assets capable of delivering substantial returns for its shareholders. Sandfire is a leading Australian copper producer which operates the high-grade DeGrussa Copper-Gold Mine, 900 kilometres north of Perth and has a growing portfolio of exploration interests and joint ventures in highly prospective mineral provinces around Australia and overseas. These discussions have commenced, with a draft prepared and sent to Sandfire for consideration and negotiation of the Joint Venture Agreement is underway. White Rock is entitled to continue managing the project for at least the first year of the earn-in and to be paid a management fee equal to 10% above all project expenses, with 50% of the fee to be paid on signing of the Joint Venture and the balance to be paid in three equal instalments (each representing 16.67% of the management fee) on a quarterly basis thereafter. Ongoing management responsibility of the project will be subject to annual review and after the first year will be at Sandfire's election. “White Rock welcomes Sandfire as a Joint Venture partner that shares White Rock's vision for the exploration and development of the Red Mountain Project. "Securing a high-quality partner with world leading expertise in the exploration and development of base metals projects is a strong endorsement to the quality and potential of White Rock’s globally significant high-grade zinc VMS Red Mountain Project. In the following interview WRM CEO Matt Gill, gives Finfeed a rundown of how the projects are progressing and all we can expect in 2019. 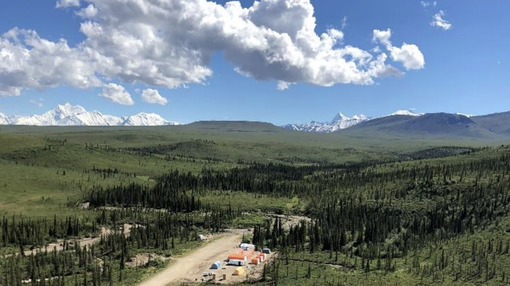 This update follows news from early December that WRM had identified a number of high-priority geochemical anomalies within it recently expanded high-grade Red Mountain zinc-silver-lead-gold-copper volcanogenic massive sulphide (VMS) project in Alaska. It completed a detailed regional stream sediment program over prospective stratigraphy within the Red Mountain project area during the 2018 field season, identifying eight high priority geochemical targets for follow-up. Prior to that, WRM announced that it had expanded its strategic landholding at Red Mountain in consultation with its strategic partner, Sandfire Resources (ASX:SFR), staking an additional 524 mining claims to bring the total to 754 and more than tripling its landholding.